PLEASE TAKE NOTE, WE REMOVED THE GET ID & PASSWORD OPTION AS MENTIONED IN THE BOOK If you have entered this link link and DO NOT have a copy of "The Sceince to Quit Smoking" by Julian Leicester. Please get you FREE copy of this book below. Only then can you understand and fully use all the quit smoking resouces given here. This page is design to help all book owners become the "Cigarette Slayer" and be committed to your health forever. Read this book with an open mind, and absorb all the information, stories, and myths about the habit of smoking. If you are asked to do a certain experiment, or listen to a friend reading a mind programming script or an audio mind programming MP3, please make sure you follow instructions. Everything in this book is in order and sequenced specially for your success. Learn to trust your willpower. Your willpower will be smarter and stronger than it’s ever been in this program. In the beginning you will need to consciously learn and apply each step. Then it will begin to get easier and easier. Before you know it, you will be able do it without even having to think about it. Change the directions of your habits so that they work for you, not against you. When it comes to quitting smoking, habit is most people’s worst enemy. For you, it will be different. We are going to re-condition your habits to make them work for you. You will put your best and highest belief into the conviction that you can succeed. I will explain simply that what you really need is the will to quit smoking and become the Cigarette Slayer. The mind programming audio techniques used in this book can be easily downloaded in the sections below.The audio will reinforce those new habits as the changes begin happening almost immediately. Think smart all the time: make your smart choice to quit smoking. Choose to quit, stick to it and you will be glad you chose right in the long run. This audio will auto start intentionally each time you enter this web-page. You can stop it easily to focus on the quit smoking information below. You can close your eyes, each time you hear this audio to completion. It is design to relax you hypnotically to curb your urges and craving. MP3 title: 911- Curbing Urges and Cravings by Julian Leicester. You are your reality. Set your mind on victory and confidence. Today you must believe even more than any obstacle in your ability to quit. Keep your confidence high and set up a new standard of commitment to health within yourself. Become conscious that you are now creating a committed decision to quit. Once made, this decision cannot be undone for whatever reason. It is your upmost priority to ensure that it is done now and not later. Be excited and constantly happy that you will succeed, as it is the best mental state to be in to achieve your ultimate goal of quitting. paper, write down or draw all the people, activities and things that really fulfill those roles: “Sara and Joseph” as your friends, or “a good friend and great cook” as your identity, instead of cigarettes. Burn the first paper. Tape the second one to the wall. Start realizing the importance of your health. When your mind starts getting clouded with conflicting voices again, stop. Practice stilling your mind and clearing it of all the debate about quitting. Find some quiet time to sit and reconsider all the benefits you will receive the moment you stop smoking. If you have previously tried to quit and failed, then understand that failure is a part of achieving success. Every success is a realization, correction and overcoming of a failure. So think: “It’s not over till I win.” This time you commit to quit forever. Treat this as a project that you must complete. It’s a project to save your lungs. Make sure you execute all tasks and timeframes in this project to quit. Keep focused and concentrate only on your end result of being a healthy, tobacco-free person. That must be your only objective and destination. Keep vigil and fervent about every action of yours to quit smoking. Don’t get discouraged if you don’t see instant results. Always keep your mind clear about reaching your quit. Action is the only way to quit. Act on all that has been taught in this book. Take massive action today for your world-class commitment for health. Be the Cigarette Slayer. Feel good in your skin. Take a few moments to relax. Feel calm and comfortable. Envision a clear image of yourself as a healthy person, living in absolute, total commitment to health. See that image of you enjoying yourself, experiencing vibrant energy and the freedom of being in good health, and let yourself feel good. Decide that smoking is over for you forever, because you do not need it. You are happier smoke-free, which is far better and healthier than being your previous smoking lifestyle. Stay in touch with this wisdom. Imagine how wonderful you are because you’ve decided to be a healthier person. Never before have you been so determined to take charge of your health. Today, you will yourself to achieve a healthier future. Appreciate and thank yourself for that: go ahead, make yourself a card, or say the words “Thank you!” aloud. Be grateful, not bitter. If you keep thinking about the difficulties and discomfort of not smoking, then that’s what you will attract and get more of. Instead, direct your mental energy to how grateful and thankful you are for a chance to be healthy soon. Start bragging. Tell everyone proudly that you are a committed person who will not smoke anymore. This is one step on the road to making your thoughts the same as your reality. Don’t get discouraged if you slip up. Don’t let any setbacks or failure disillusion you about reaching your quit. 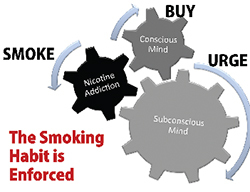 Decide and act to end this habit until it’s terminated, even if you make some ‘smoke again’ mistakes along the way. Consider this your moment of destiny. This is your tipping point in life where nothing is going to stop you from quitting smoking. You operate in your mind with certainty to succeed now. It’s time to get really serious about your life. Today is the day you fix all your negligence and implement good health standards in your life. Smoking must be eliminated. Return to the door exercise on page 91. (download your PDF here) At any moment in your day, you can stop and open that door out for yourself. All you have to do is stop throwing yourself at the walls, and reach for the handle. Believe you deserve it. Your life deserves to be treated first-class. Your lungs do not deserve the extra pollution that smoking brings. Practice letting good things into your life without guilt—ask your friends to write you cards with compliments that you can reread, visit a friend, spend time doing something you love—until you believe that you deserve these good things. Not only do you deserve good things, you deserve to ask for them. Quitting smoking is not a lonely goal. Search out friends who have quit successfully. Many smokers have quit. You can quit now. Being around other successful quitters will make it easier to believe that it is possible for you. Close your eyes everyday for several minutes and visualize having what you wanted. Don’t skip a day— spend a few minutes each and every day secure in the feeling of being a non-smoker. Feel the feelings of already having it—“I am smoke-free now.” When you open your eyes and come out of that visualization, now focus on what you are already grateful for, like having a good life, family, relationships or a great job. Be happy and optimistic always, focusing on ways to enjoy and feel great about yourself without your former cigarettes. Keep the inner talk in your mind always positive Your subconscious is being retrained with positivity. Decide to make it your daily routine to think and act in a way that gets an immediate better commitment to health. Try keeping a rubber band around your wrist that you snap whenever you notice your inner talk turning negative, or some other tool for reminding yourself to change the direction of your thoughts. Meanwhile, share your positive talk in your mind with others or even say it aloud to yourself—saying things aloud tends to make them seem more real. Use Kevin’s mind-programming script on page 115. (Download your PDF here) This is the first step to changing your thought processes. Stay open-minded towards to always; even when you feel pessimistic or skeptical, stay open to the idea that the thoughts suggested by the script are doing their work. Additional exercises to grow those seeds are available at the Science to Quit Smoking website. You react to each moment in your day—not your habit. When you encounter stress, daily patterns, or other moments of decision, stop and make sure that you, the person you want to be, is reacting— not your old subconscious habits of smoking. Every act of defiance to your former smoking self can be made strong and effective by holding your quit vision in your mind. Bring that vision up for yourself whenever you need to. Put the whole power of your faith and purpose towards quitting smoking forever. At work or at home, keep your focus off other people who smoke around you. You are free now of the burden to join them and pollute your lungs again. Today, you are free from the smoking influence of family, friends, workers, and anyone in this planet who still smokes. You are your own decision-maker and in control of your life and choices today onwards. Whenever you feel discouraged or just tempted to smoke a cigarette, squeeze your thumb and index finger together and tell yourself, “What do I really need now?” What is the real emotional need that you are feeling? And what is a kinder, more effective way to help those emotions? Decide that you would be foolish to smoke even one cigarette again. Tell yourself that you are stronger than those dried leaves and that you are going to keep busy now, and let those impulses to smoke fade away. Set your rules. Set some inner rules for yourself now, based on what you know about yourself and your inclinations. These rules are absolute. Be firm on them. Your rules can be as simple as “I will not spend money on any form of poison,” “I dislike being treated as a smoker,” or “I’m the caretaker of my body’s temple: No littering or polluting it.” Try to make only as many rules for yourself as you need: too many rules are overwhelming and will make your task seem impossible. Make your daily routine support your commitment to health. More than just rules, this means thinking and acting in ways that commit you to health. Fill your day with activities and behavior that replaces the emotional needs of smoking: if you felt that you needed a cigarette to start the day, look to other rituals to get the day going, like a slowly –savored cup of coffee or a few minutes sitting outside, enjoying the morning air. This is your opportunity to have fun: transform your daily routines so that they support and excite you, not challenge you. Cultivate the knowledge that your non-smoking mission will be accomplished. You can always feel good about this mission, anytime, no matter what. It is not over till you win. Call up your vision of your smoke-free life whenever you make decisions of any kind. Every act can be made strong and effective by holding onto your vision for your life while you are doing it. Put the whole power of your faith and purpose into this vision of quitting smoking forever. Make sure you are consistent and follow the steps provided. There is a science for success in this program. Omission, half-efforts, and modifications are a big No-No! Learn the trade and not the tricks of the trade.